Former saloon owner Joseph Gillek, 57, wasn’t a big fan of Prohibition, and like many other Angelenos he simply ignored the law. He’d spent the evening of February 25, 1928, drinking — most likely in one of the dozens of blind pigs operating in the city during that time. With the bootleg booze eroding his already dubious judgement, he compounded his unlawful behavior by getting behind the wheel of his car to drive himself home. His muddled thinking resulted in a smash-up as he rammed his flivver into a retaining wall at his home at 201 South Bunker Hill Avenue. When his 30 year old son, Joseph Jr. came out to see what had caused the racked and saw his inebriated father lurch out of the automobile, he reamed the old man a new one. Once the shouting had died down Joseph Sr. burst into tears, declaring that he no longer wished to live. 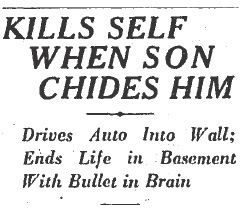 Later that evening he went into the cellar with his revolver and shot himself to death. 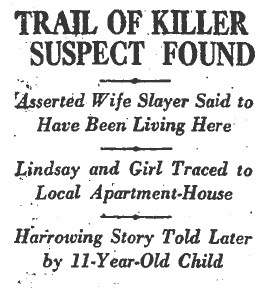 It was a quiet February day in Seattle, Washington when Frank Lindsay ended the argument that he was having with his wife Audrey by bashing her over the head with a hammer, slashing her throat, sewing her body into a burlap bag, and then burying her behind the barn on their property. Grabbing his 12 year old foster daughter Pearl Grant, and a few hastily packed bags, Frank fled his home and high-tailed it south. He would later say that he took the girl with him because he thought that traveling with a child would give him a better cover story. 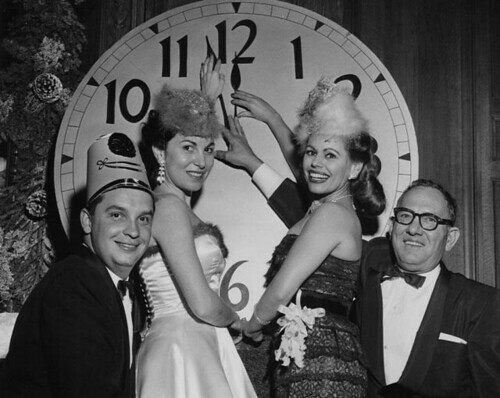 It wasn’t long before he realized that being on the lam with Pearl was a bad idea, and he subsequently abandoned her in a rooming house in Oakland. Frank finally landed in Napa, where he befriended the parents of 11 year old Beatrice Dellamore . He picked fruit alongside the family for several days, eventually convincing the couple to turn the girl over to him. Mr. Lindsay said that he knew a woman with money who could provide Beatrice with everything that she lacked as the child of itinerate laborers. 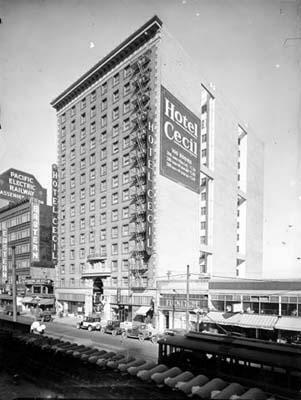 In truth, he kidnapped the girl and took her with him to Los Angeles, where he checked in at the Hotel Cecil for a few nights. Then Frank did what so many other fugitives had done before him – he sought refuge in a Bunker Hill rooming house. Representing himself as Mr. R.F. Williams, he told people that Beatrice was his daughter. Lindsay kept the girl for two weeks in the rooming house, and then decided to put her on a bus back to Napa. Upon her return home, Beatrice was able to provide information about Frank, but the elusive spouse slaughterer continued to evade capture. Audrey’s brutal slaying and speculation about Frank’s whereabouts were big news up and down the west coast. However, it wouldn’t be professional law enforcement officers who would eventually locate Frank, it would be an amateur detective named William Sanborn. For a few of the months he was on the run, Frank had worked as a fry cook in the restaurant that Sanborn managed on Vermont. When Frank left the job, William lost track of him. William continued to devour his favorite true detective magazines, and in one of them he read a lurid tale about the grisly murder of a Seattle housewife. In the same magazine he found a description of the missing husband who was being sought for the killing – and William strongly suspected that the wanted man was none other than his former cook! It was by chance that William bumped into Frank at another restaurant on Vermont where the absconder was again employed as a fry cook. Fueled by the spine tingling exploits of the detectives he idolized in his beloved magazines, Sanborn vowed that he would apprehend the killer on his own. During their past conversations, the restaurateur had learned that Frank was a jack of all trades. Not only was he a cook, he was also an accomplished plumber. Sanborn told Lindsay that he needed some work done at his home and, sweetening the pot with the offer of some under-the-table cash, Sanborn was able to get his plumbing repairs completed before he dropped the dime on the wife killer. As an upstanding citizen and detective wannabe, Sanborn needed to be absolutely sure that he was pursuing the right man. He contacted the homicide squad and was handed a photo of Lindsay, which he immediately identified as an image of his former employee. 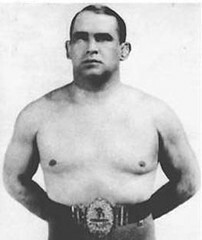 In a move that was dangerous at best and completely insane at the worst, Sanborn then confronted Frank with the photo at the restaurant where he was working. Frank took the picture and held it in his fingers, thereby conveniently fingerprinting himself. When cops ran the prints, they matched those of the runaway murderer. Detectives turned up at the Stanley Apartments at 210 South Flower later that evening, and took Lindsay into custody without incident. There were many facts about which Frank hadn’t been forthcoming – like his real name, which was discovered to be Charles E. Murphy, as well as his place of birth, which was not Massachusetts as he’d claimed, but rather someplace in the UK. We should give the devil his due though, because at least he was truthful about having served in both the British and U.S. armed forces. However, what he’d neglected to reveal was that he had deserted from both. And if all of those lies weren’t enough, it was uncovered that Frank was already married when he met and married Audrey! Because Frank had lied about most of the details of his life, police were skeptical of his claim that it was Audrey’s nagging that had compelled him to spontaneously murder her. And the authorities also didn’t buy his alternate version of Audrey’s murder in which he was not the attacker, but instead was valiantly defending himself from certain death at the hands of his enraged wife! His story may have been more credible if he hadn’t pre-dug the grave into which he’d dumped Audrey’s corpse. It took them a while, but police finally untangled Frank’s web of lies. They concluded that when Audrey had accused him of the criminal assaults on several young girls in the Seattle area (including attacks on their foster daughters), and then threatened to turn him in, Frank snapped and murdered her. 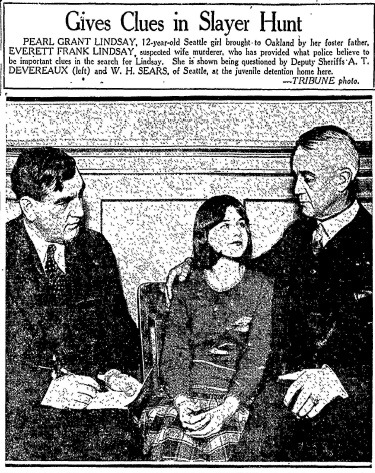 Frank was shackled and extradited from Los Angeles back to Washington, where he was tried and convicted for Audrey’s murder. He was sentenced to 65 years in Walla Walla Prison. The sound of the prison gates slamming shut behind him should have signaled the end of the story, but Frank would make news again in 1947. Frank was on his best behavior in prison and would eventually earn trustee privileges. By January 1947, he was working as the cook in the warden’s home. One day, Frank simply walked away from the prison and vanished. On the run for most of the year, he was finally recaptured in a restaurant in Denver, Colorado, where he was found plying his usual culinary trade.After his unsuccessful escape from prison, Frank would disappear from the newspapers entirely. Move over Rin-Tin-Tin, there’s a new wonder dog in town, and his name is Pompey. We humans may be nasally challenged with our measly 5 million scent receptors, but German Shepherds have 225 million – and they know how to use them all. With that kind of super hero sniff power, it was no surprise when a German Shepherd named Pompey caught the aroma of gas fumes, desperation, and imminent death in the air. The surprise was that he was galvanized into action. Pompey and his mistress, Mrs. Mitalzo, were out for a stroll on South Bunker Hill Avenue. The dog became increasingly agitated as they drew nearer to a rooming house just up the block. A few doors away from the building, Pompey began to growl. When his hair stood up on end, Mrs. Mitalzo bent over to try to soothe him. She had relaxed her grip on Pompey’s leash for only a moment, and it was then that Pompey broke free. He ran up the steps of the building, and into the apartment of Mr. William A. Stark. The 24 year old Stark had just been discharged from his job as an elevator operator at a downtown hotel. Management had told him that he was through because he didn’t close the elevator doors properly. The despondent man had taken several newspapers and fashioned them into a long cone. He placed the small end of the improvised suicide device over a gas jet in his room, and he placed the large end over his face. Stark then turned on the gas and lay down to die. When Pompey entered the room, Stark was unconscious and near death. The valiant dog dragged the motionless Stark into the safety of the hallway. Mrs. Mitalzo ran into the rooming house to search for Pompey and discovered him watching over the dying man. Police were summoned and Stark was taken to the Receiving Hospital, where he was revived. Pompey stayed around long enough to see the ambulance pull away. Apparently satisfied with the outcome, the dog rejoined his mistress and the two continued their stroll. 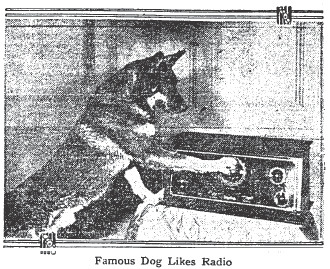 Pompey vanished from the pages of the Los Angeles Times after his brief moment in the limelight, but his famed counterpart, Rin-Tin-Tin, was just beginning his film career in 1923. Rin-Tin-Tin was only five days old when he was rescued from a bombed out kennel in France. WWI was drawing to a close when a U.S. solider, Lee Duncan, spotted the kennel and decided to investigate. He saved two of the puppies and brought them home with him to Los Angeles. Rin-Tin-Tin (aka Rinty) was seen performing in a local dog show by movie producer Charles Jones – and a star was born. Rinty worked hard and would often relax by listening to the radio. His career lasted for over a decade and eventually earned him a star on the Hollywood Walk of Fame. Rinty passed away quietly in his sleep at the ripe old age of 14. Harry L. Redd was crawling around beneath the city streets attempting to repair a telephone wire, but it was so dark he couldn’t see a thing. He’d been catching a whiff of gas fumes for the past few days in the same location, yet without thinking he fumbled around in his pockets until he found a match. He scraped the match across his trousers and, KABOOM! Harry’s world caught fire, leaving him dazed and in excruciating pain. The force of the explosion hurled him back against some pipes. 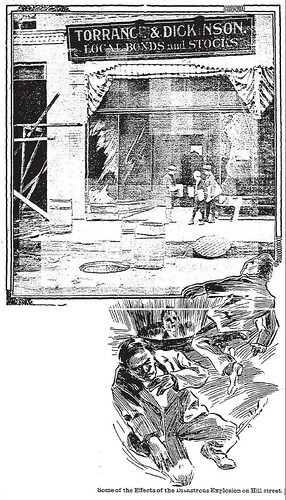 The injured man was snapped back to his senses when a second blast thrust him out of the manhole and into the street. He was so violently tossed around that he rolled for a few feet, and then fell backwards through the manhole. Unbelievably, although badly burned, Harry survived. Several bystanders were hurt, including a small boy named Albert Adams who had been attracted to the site moments before the blast. He’d been walking down the street when he noticed the open manhole. Albert was curious and had poked his head into the hole to see what was going on when the first detonation occurred. 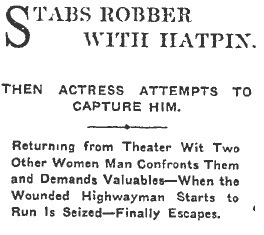 The lucky young man escaped with nothing more serious than singed eyebrows. The eruption was so powerful that a heavy iron manhole cover at Fourth and Hill Streets flew up into the air and flipped over several times before returning to Earth. The only building to suffer damage was at 331 South Hill where the windows were shattered. To avoid this kind of accident in the future, maybe we’d better review a couple of childhood lessons: don’t run with scissors, don’t put anything bigger than your elbow up your nose, and never light a match if you smell gas. Sailing, Sailing — Off to City Jail! K.W. Cross (19), C.J. Terry (20), and R.P. Cullison (18), had been sailors for only two months when they came to the conclusion that a sailor’s life wasn’t so damned merry after all. In fact, each of the swabbies was positively desperate to get out of uniform and back into civilian life, so they hatched a plan to get themselves discharged from the service. The young men had heard that if they were arrested for a crime, their naval careers would come to a screeching halt – so they burglarized a small tobacco store at Fourth and Hill Streets. They made no attempt to flee following the crime, and were busted at the scene by Police Detectives Simpson and Jarves. It’s possible that Cross, Terry, and Cullison were naive enough to believe that once they’d committed a crime, they’d simply be cut loose from the Navy and put back on the streets to pursue merrier lives. If so, they must have been very disappointed. Although they were immediately discharged at San Pedro as expected, all three youths were then taken into custody, and confined in the City Jail for six months each on the burglary rap. “Mama don’t let your babies grow up to be cowboys. Don’t let ’em pick guitars and drive them old trucks. Eight year old Willie Fisher waited until the early hours of the morning, then lifted $3 from his mother’s purse and disappeared.When Mrs. Fisher realized that her boy was missing, she immediately contacted police. She told them that she believed that the child had boarded a northbound train to become a cowboy, or maybe a lawman. Detectives combed the city for the budding cowpoke – finally following up on a clue that put the runaway in a vacant lot near Eighth and Spring Streets. At last, a cop spotted two small boys trying to hide behind an old fence. Sure enough, it was Willie and his best friend, Bob. The youngsters were examining an air gun, and deep in conversation. The detective crept up behind them until he could pounce. The boys were surprised to learn that they were wanted at the police station. On the way to police headquarters, the detective asked Willie why he’d run away from home and what he intended to do. The officer saw Willie’s point, but marched the wee manhunter home anyway, where he was met at the door by his mother. She was slapping a mean looking slipper against the palm of her hand. It’s just as well that Willie and Bob never got the chance to put their plan into action, as Chris Evans and John Sontag were wanted for train robbery and murder, and they were unlikely to have been felled by an air rifle. In fact, they’d already survived a shoot out with one posse, and it would take at least one more to bring them to justice. Due mainly to the support of people in the San Joaquin Valley, both robbers had managed to evade the law. Southern Pacific Railroad had cut a ruthless swath through California, displacing people and gobbling up their land, so when Evans and Sontag struck out at the much despised company, people cheered. 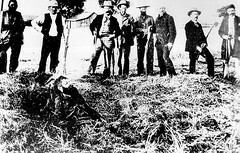 John Sontag near death as posse looks on. 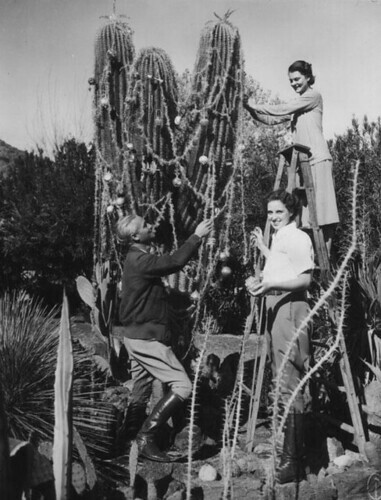 Neither children nor Pinkerton Detectives ended up capturing Evans and Sontag. On May 28, 1893, the bandits were surrounded by a posse of local lawmen, and a furious gun battle ensued. 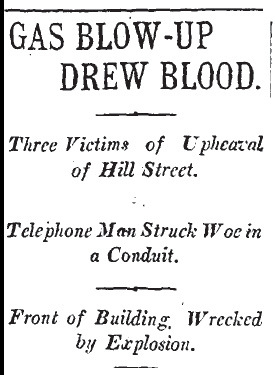 Both men were wounded. 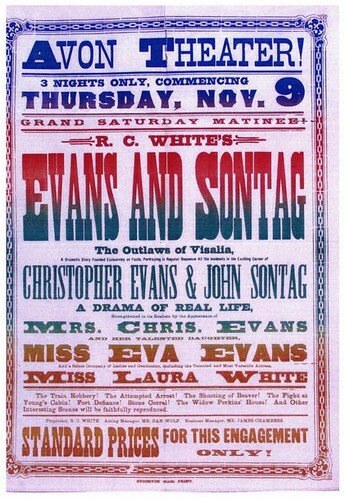 Sontag died of his injuries, but Evans managed to escape. He came upon the home of Mrs. Parsons, who invited him in, and then dressed his wounds and put him to bed. 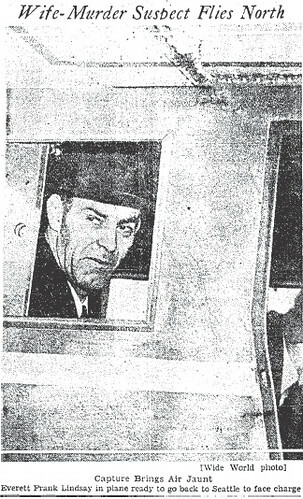 Evans knew that his career as a train robber had ended, and he agreed to let Mrs. Parsons turn him in to the law if she would agree to split the reward she received with his wife – which she promptly did. While Evans was awaiting trial, his wife and daughter were contacted by a San Francisco theater company. 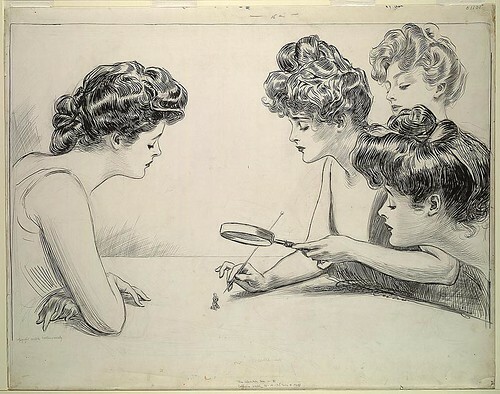 The girls were offered money to appear as themselves in a production about one of the train robberies. Both mother and daughter agreed, putting the money they’d earned in a defense fund for Chris. 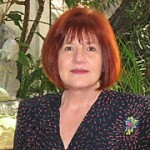 It was to no avail however, and Evans was sentenced to prison for life. The story doesn’t end there. 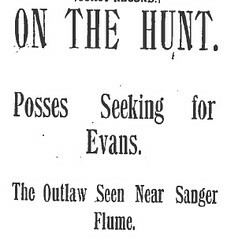 Evans managed to escape from jail before he could be transported to Folsom Prison. After a brief taste of freedom, he was recaptured. Evans served his time and was released in 1911. He died in a state hospital a few weeks later. Here’s hoping that young Willie chose to become a doctor or lawyer, or such.